Re-posted from Friday, March 20, 2009 because I recently revisited it, liked it, and thought others might be interested. Perhaps our experience with democracy has misled us into thinking that God is not so much the eternal King of creation as just a candidate seeking that office. The heresy which lurks behind the otherwise welcome revival of Christian healing is the unwillingness to accept the inevitability of death. Isn't Deism in its image of an uncommunicative and withdrawn God open to the charge of imagining God as a Person fit only for radical psychoanalysis? A friend of mine once compared the modern world's attitude toward God to the kind of deference which a parish priest pays to a rector emeritus—it is pleasant to have the old fellow about, and on ceremonial occasions he graces the head table. I still enjoy dipping into it. One of the editors of this fine book is Ben Quash, an Anglican priest, a professor at King's in London, and the canon theologian at Coventry. The other editor is Michael Ward, an Anglican priest and writer and former chaplain at the coolest college in Cambridge: Peterhouse. Quash wrote the Prologue. 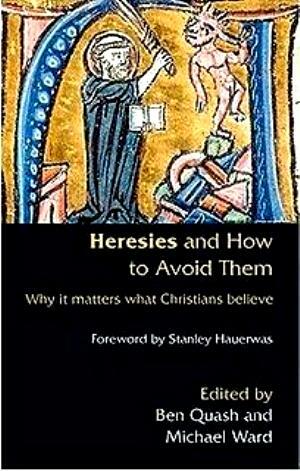 Sounds interesting for some of the same reasons Modern Heresies was—I've ordered it. I belong to a denomination that doesn't hunt heretics. We are "non-creedal." Our Statement of Belief is intended to be descriptive of what most of us actually believe rather than prescriptive. When our last doctrinal statements were adopted about a generation ago, I recall having a conversation with a pastor who was upset that the statement on God was trinitarian. He said we were "reading him out of the denomination." I assured him that we were not—that, in fact it was up to him to decide whether he wanted to associate with a bunch of people with whom he fundamentally disagreed. He wouldn't [couldn't] be kicked out. Orthodoxy is important—whether enforced by some central authority or not. I am pleased that our Statement falls within those boundaries. 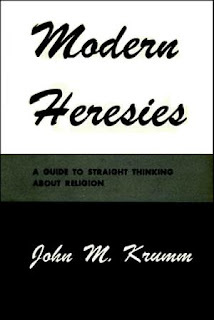 I would be as uncomfortable among a people who could not affirm the faith as he apparently was among those who could.